Steven Kasher Gallery invites you to a magical holiday exhibition. The show features new fabric and wood sculptures by Mister Finch which push his charming and subversive creations to new levels of complexity and hybridity. Also featured are new color photographs and photographic grids by Patricia Heal that pay tribute to Finch’s toadstool works. The exhibition is curated and designed by noted creative director Michael Reynolds. This is the second exhibition of Mister Finch at Steven Kasher Gallery and the first of Ms. Heal. 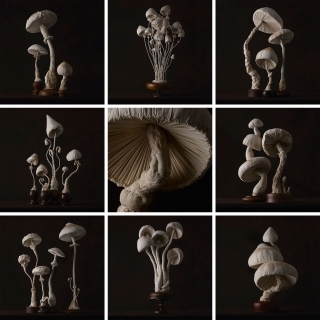 Mister Finch creates specimens both pretty and poisonous, creatures half flora, half fauna from a slightly subversive wonderland where poetry awakens from decay. Mister Finch writes, “Folklore is so beautifully rich in fabulous stories and warning and never ceases to be at the heart of what I make: shape-shifting witches, moon-gazing hares and a smartly dressed devil ready to invite you to stray from the path. I make storytelling creatures for people who are also a little lost, found and forgotten. I want to inject a bit of old-fashioned magic back into the world.” British folklore and the life cycles of insects and flowers are literally and figuratively woven together in his stuffed sculptures. Though he has no formal training of any kind, his mastery of the needle can be seen in intricate details of his impeccably hand-sewn menagerie. 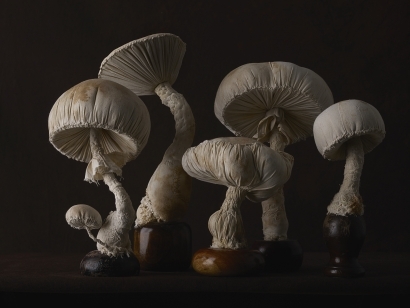 Patricia Heal photographs of Mister Finch’s pale toadstool sculptures against a midnight velvet background. The images are timeless, haunted, dreamlike. They are printed in scales that range from wall-sized to grids of small prints. They place us in a haunted room where the sculptural and the real, the natural and the manmade, ambiguously tango. A textile artist from Leeds, England, Mister Finch began his career as a jewelry designer. After leaving the fashion world, he devoted himself to working exclusively in textiles. After garnering a cult following on Etsy, he installed his debut exhibition, Cinder Embers, in November 2014 at the Anthropologies flagship on Kings Road in London. His first book, Mister Finch: Living in a Fairytale World, was published by Glitterati in 2014. His most recent exhibition, Mister Finch’s Handmade Museum, was held at Steven Kasher gallery in the summer of 2015. Patricia Heal is a New York based still life photographer. Heal’s clients include William Sonoma, Anthropologie, Neiman Marcus, Calvin Klein, Bloomingdales, WSJ, Bon Appetit, Real Simple and Martha Stewart. She has received numerous awards in the field of photography including a Fuji film award, Nikon/PDN self-promotion award, Communication Arts, and an IPA International award. As well as being a noted commercial photographer, Heal has also had fine art shows at galleries in New York, London, and Salcombe, Devon. Patricia resides in New York city. Michael Reynolds is a New York-based creative director who works across many disciplines and media as an editorial stylist, exhibition and set designer, advertising director, curator and visual brand consultant and editor. His services have been enlisted by a wide range of high-profile clients, including Calvin Klein Home and Fragrance, Herman Miller, Vera Wang, and Aerin Lauder. Reynolds was a key member of the team that conceived and launched Wallpaper, the award-winning, London-based magazine. Today, he continues in his role as Wallpaper’s US editor while also serving as a contributing editor to Architectural Digest, Conde Nast Traveler and T Magazine. His recent curatorial work includes notable projects for the Albright-Knox Art Gallery in Buffalo and the influential New York decorative arts gallery R 20th Century. His first book, Tom House, about Tom of Finalnd, for Rizzoli Publications will be published in Spring 2016. The Holiday Pop-up Shop of Mister Finch will be open December 12th – December 23rd, 2015. Steven Kasher Gallery is located at 515 W. 26th St., New York, NY 10001. Gallery hours are Tuesday through Saturday, 10 AM to 6 PM. For more information about the works in the pop up exhbition and all other general inquiries, please contact Cassandra Johnson, 212 966 3978, cassandra@stevenkasher.com.